What if we told you that you could start seeing the results of orthodontic treatment in as few as six months? In fact, what if we took it a step further and said you could have the straighter smile you’ve always wanted without needing traditional braces? At Aberdeen Dental Centre, we understand that our patients in the Vernon, BC area want cost-effective dental solutions that provide real, natural-looking results. With Invisalign clear aligners, patients can uncover the true potential of their smile discreetly and quickly. We can create a 3D model of your mouth that can visually demonstrate your new smile after Invisalign treatment. This amazing tool allows patients to feel confident in their treatment plan. Aligner trays are removable which makes oral hygiene and enjoying favorite foods a breeze. 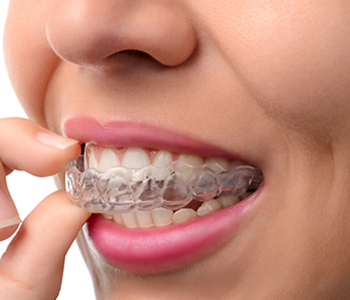 Aligner trays are made from a clear, comfortable plastic which makes treatment discreet. There are no wire-tightening appointments, patients come in for progress checks about every six weeks. Treatment with Invisalign aligners is simple. Patients are given a set of custom-made trays to swap out every two weeks. During this time, teeth will gradually shift into proper alignment and patients will enjoy watching the transformation of their smiles. Are you ready to find out why so many patients trust Invisalign to get a straighter smile? If so, call us today at (250) 545 3319 to schedule your consultation.